(Nanowerk News) The team, led by the University of Cambridge, have invented a way to make such sheets on industrial scales, opening up applications ranging from smart clothing for people or buildings, to banknote security. Using a new method called Bend-Induced-Oscillatory-Shearing (BIOS), the researchers are now able to produce hundreds of metres of these materials, known as 'polymer opals', on a roll-to-roll process. The results are reported in the journal Nature Communications ("Large-scale ordering of nanoparticles using viscoelastic shear processing"). Researchers at the University of Cambridge have devised a method to produce "Polymer Opals" on an industrial scale. A synthetic material which mimics the brightest and most vivid colours in nature, and changes colour when twisted or stretched, has been developed by researchers at the University of Cambridge, and could have important applications in the security, textile and sensing industries. 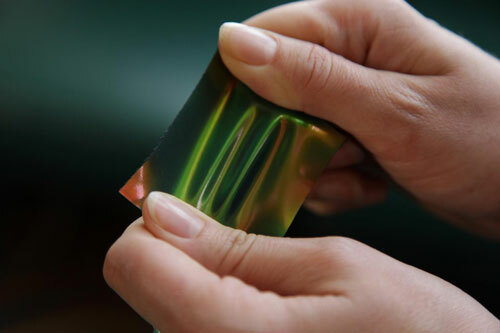 The Polymer Opal films change to green and blue when stretched, and to red when compressed.